The object of this solitaire game is to build a complete face-card gallery of Jacks, Queens, and Kings. You build sequences of cards on the Foundation rows by suit (building rules: top row 2-5-8-Jack; middle 3-6-9-Queen; bottom 4-7-10-King) using the cards of the Tableau and the still incorrect cards of the Foundation. Deal cards from the Stock to the Tableau as needed. At the end of the game, let the computer play out the same starting situation a few times. 24 piles: 3 rows with 8 columns. Empty spots can be filled with the base cards "2", "3", and "4", as above. Building rule: Add cards by suit, in increasing rank, by a difference of 3. Cards at their correct position have an altered appearance (no number, plus a narrow frame). 8 piles are fed by the cards played from the Stock. Only completely visible cards are available for play. The Stock initially consists of two decks (104 cards). As the game begins, the first 24 cards are played to the Foundation. 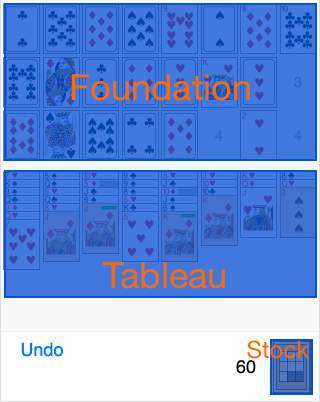 Each time you click Stock, 8 cards move into play, one to each of the Tableau piles. Ace Pile: Aces are automatically removed to the Aces pile and are not a part of play. The game begins by dealing 24 cards, face up, to the Foundation and 8 cards to the Tableau. Some of the cards on the Foundation may now already be at their final position ("2", "3", "4"), and aces go directly to the ace pile. Just tap on a card to play it (it finds its correct position automatically). Deal another 8 cards from the Stock to the Tableau. Undo an operation on the Stock. Or, you make a better score than the computer (see the "Statistics" tab). For your personal evaluation use whatever measure you like (better than the minimum or better than the median or the mean). You do not have to play all cards which are movable. Look for the position of the twin card (the card with the same suit and rank). This can help you avoid (final) jamming situations. Focus on the optimal sequence of moves. Try to resolve "jammed situations": In the Tableau, a card may cover another card which needs to be played on the Foundation first. This creates a jam, which you can resolve using the twin of the trapped card, when it comes into play. Yellow shaded cards are movable. Concentrate your efforts on making good decisions instead of searching around for movable cards. "Jammed situations" are marked by a blue bar. If there is no movable card, the Stock is marked by a blue point. Click on Stock to get 8 more cards. With the exception of actions on the Stock you can undo one or more moves. During the evaluation process each single result of the random process gets a small square. Blue: your result is better - white: drawn - red: computer is better - green: solved game (result 0). In the context of a competitive product you can find a detailed explanation of the strategy for winning this game: Winning at Picture Gallery Solitaire.